The Swedish company IKEA, has developed a refugee camp tent to improve the lives of millions of refugees. 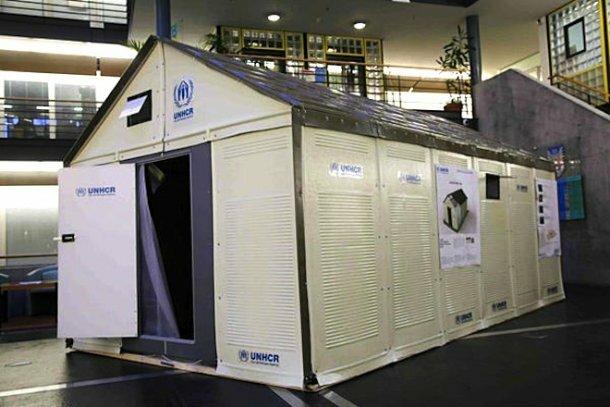 The Ikea Foundation and Acnur, have approved during the World Refugee Day the Flat Pack Shelter. The Flat Pack Shelter is an innovative project that seeks to improve the quality of life of millions of people who have been forced to migrate due to political conflicts or natural disasters. The camp houses are prefabricated and efficient. The project supports the idea that kids are the most “important thing in the world” and that it is important for them to have a place “called home”. The average age of those who live in these shelters are refugee kids of 12 years old. The first camp sites and tents are being built in the Ethiopian and Somalian border. The cost per Flat Pack Shelter is about 750 euros, the tent last has a life-span of about 3 yrs and can be transported and put away as a compact packet. The house can be put together 4 hours and it is easily transported due to the light weight of the materials is it made of. The shelter’s roof is made of a solar panel that allows the it to have its own electricity, allowing every day tasks to be completed.The roof panel also serves to regulate the temperature inside the shelter. The Flat Pack Shelter is a “sustainable, durable and economical” home for all the refugees in need. This entry was posted on June 29, 2013 by mcquant in Cases and tagged Acnur, Housing, Ikea, ONU, Refugees.